In order to try to conserve cash for important stuff like backpacking, beer, petrol, beer and beer, I decided to start baking my own walking confectionary again. This mainly consists of mincemeat buns – a bit like small Christmas cakes, I suppose, flapjack and the occasional ginger cake. This time I made a dozen very manly-looking mincemeat buns and some flapjack. I decided to coat the flapjack in chocolate, just by way of a change and, as there was a small amount of icing left from Mrs K’s celebratory cake making the other week – I thought I’d try to inscribe the thing with a motto or logo. 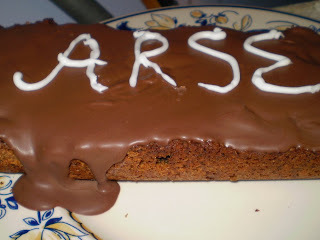 I was going to write the name of a famous footy team, but ran out of both icing and flapjack. Anyway, the pick shows the result. If I can get my Everton out of bed in the morning, I’ll take some of the cakes with me. 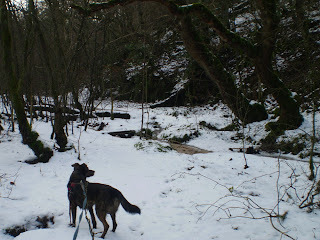 I’m just testing a way of posting things a bit quicker than typing it into blogger. Copy and paste dontcha know. Probably too young to see the point anyway. Happy birthday Becky!! Mwah mwah…. **I ought to point out that the pic is Adminfairy's nephew. He's just had a yoghurt for that bloated feeling. Its an old picture. I expect he wouldn't be too happy about this. I caught up with the Go4awalk motor home (containing Mike from go4awalk.com)somewhere along the A590 and followed it to Millom Rugby Union Football Club where, for a small consideration, they let me put up my red Wild Country two man tent – veteran of two TGO challenges and a couple of Cairngorm wild camps involving only short walking from the car cos its heavy. But I devolve…. Shortly after this we were embarked on the path up the South end of Black Combe the hill fog at about 450 metres, so there wasn’t much of a view. Apparently, you can see Wales from here. You can certainly see Black Combe from Wales on the occasion of very clear weather. It must be quite a long way. Somebody should measure it. Anyway, after a spot of chicken butty, banana and green tea in the windy summit shelter, we plodded off to bag the very lovely (if you’re a fan of red bog grass) Stoupdale Head and then White Combe, which is more of a shoulder than a summit, but which bears an enormous and ancient cairn and a cracking view of bits of Morecambe Bay. The little gem of a hillock White Hall Knott followed, and then a steep and uncomfortable descent through dwarf gorse (whatever you do, if you go this way, don’t slip on your arse…) and an easier-than-it-looks-on-the-map-due-to-the-fact-that-there’s- quite-a-good-track-most-of-the-way (phew) handrailing of the intake wall back to Kirkbank Church where we’d left the car. There was then a short interval for eating, dozing and drinking beer in front of the fire in the Rugby Club bar. And then it was tomorrow, or, rather, Tuesday. The day started in driving drizzle off the Irish sea and continued mush in the same vein most of the day. We did a circuit of Devoke Water, adding a couple of tops just for the ticks. 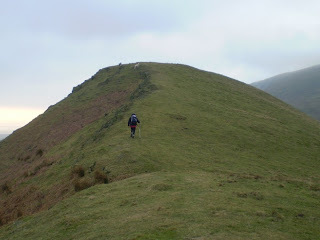 The round was Rough Crag – Water Crag – Birkby Fell – The Knott – White Pike – Yoadcastle – Seat How. The last one being the exciting one due to it’s craggy defences. These are quite good hills for climbing in the drizzle since they appear much bigger and snowier when they’re looming out of the hillfog. I didn’t take many pics due to the rain. But we managed 6 miles for apparently, a lorra lorra effort- it was the wind, the heavy going, the wet weather clothing, the lactic acid from the Rugby Club Bar…. I was quite taken with Millom – friendly place, chip shop, seaside…. There's been a short hiatus or pause in the postings. This will continue for a couple of days as I've just packed the knipemobile for a night's camping in Millom. This may well be explained in a later post. In the meantime, me and Mrs K and the next door neighbours are just about to leave for Bishop Auckland Town Hall for a traditional night of flicking hot candle wax and lit matches at each other, as well as capturing people and holding them against very hot radiators. Yes, folks, it's Burns Night again. 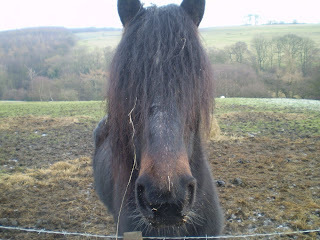 Later, we'l be eating that well known North_east England delicacy, Haggis an' turnips and tatties. The turnips have been retireved from a field full of pregnant sheep. They're only partially chewed, so it looks as if we're in for a good night. Back Tuesday night by the way. 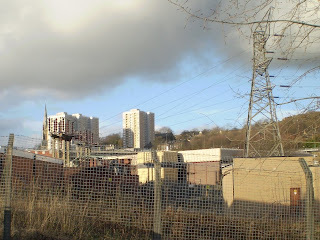 Pic is some electricity things and council flats in Halifax. (We just had another family do there) I call it "Visions of Halifax" part of my outdoor visions due to drinking too much strong coffee collection. This is yet another shameless plug – but this time for something that’s really got nothing to do with me. Really avid readers may remember me mentioning writing a short blurb or description of the West Highland Way from North to South and that perhaps, in view of the fact that I’ve never actually walked this route, somebody might like to check my writing. Thanks to Aktoman and Martin Rye for the proof reading, suggestions and pictures, the much improved description is now in the hands of the Travistrek team. As well as all this, there’s a Gig entitled “Madchester Lives On” – a celebration of Manchester bands to be held at Tan Hill Inn on 7 Feb 2009. Be there or be square like me by the way…. This bloke Scott is quite amazing as it happens, the video will dispel any doubts as to the man’s chances of success. Anybody fancy a bit of wild camping and wild(ish) music near Tan Hill? My get-yourself-fit-for-the-TGO-Challenge plan (see how it takes over your life?) calls for a walk of a minimum distance of 12 miles in January (14 in February) and so - me and superdingo found ourselves in the enormous and free car park at Blanchland for this little toddle on to the Northumberland Moors. 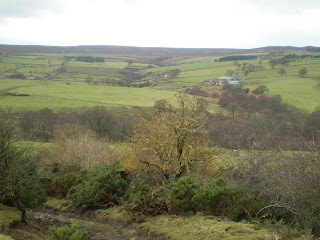 Blanchland Moor is a pretty flat and heathery sort of place and has bridleways suitable for a good old blast along at high speed - or in my case, fairly moderate speed. Down to the Devil's Water - no idea why its called this - its a fairly small beck in a beautiful wooded and almost wild setting - just the place to camp out, in fact. And then it was back over the moor again via the Carriers Way. 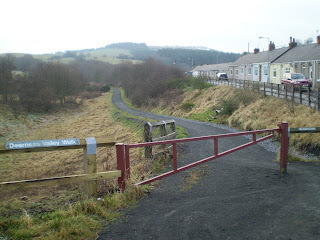 The Carriers Way is an old packhorse route blazed for the purpose of carrying bings of lead from London lead Company's mines in Allendale to the coast - before there were things like trains. 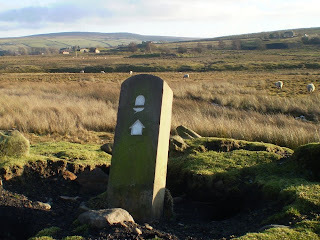 So its an old route, and it shows it in places as it cuts a deep groove through the landscape and contours easily along the scarp of the moor. Fab bit of fell walking, that. 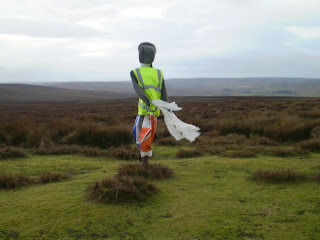 The odd thing about this moor, though, is the unusual use of scarecrows. These are very realistic from a distance, mainly due to the shredded polythene arms which sway purposefully in the wind. The giveaway is that they never actually go anywhere. there's dozens of the things, though, placed on scarp edges and hilltops and in lines like grouse beaters. It seems like a good idea if it works - keeping the raptors and corbies away from the grouse eggs and chicks in a non-lethal sort of way. We did just about 12 miles, finished almost in daylight and were in time for the two meals for £8 happy hour at the pub at Billy Row. I'm not staying in Ft Augustus or Braemar - but just scoffing, shopping and passing through to wild camps or bothies further on. I will be overnighting at Tomdoun, but not in a bed - far too overpriced for me. I'll stick me tent up somewhere after the night's celebrations of whatever it is we might consider worth celebrating. I got invited over to Doug's in the Deerness Valley for a looking at maps of Scotland whilst drinking whisky session. So I walked over from Crook and we had a couple of house drawing lines on maps and he let me into one of his Christmas whisky bottle. Doug says he doesnt drink whisky, but he gave a bottle of red plonk a bit of a hammering. After tea (chicken curry), I walked back again in the dark. Becky's (adminfairy) pressy - the little Petzl is still going very strongly despite numerous after-dark walk finishes and a few hours in some leadmines. 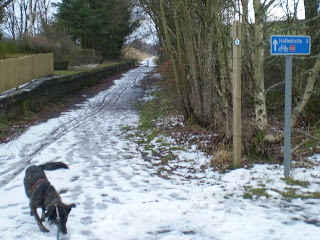 The walk is along the ex-Crook - Durham railway line and is pretty easy as far as navigation is concerned. Its a sort of point-and-fire job, really. 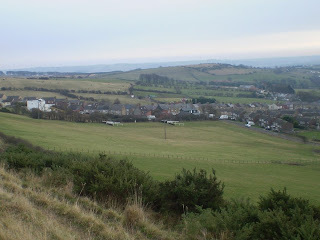 It does go quite steeply over the hill, on top of which there used to be an enormous hole for the digging of coal, which is just under the surface around here. Its all been filled in and planted with trees now, and is really very pleasing to walk on. Todays walk was just 8 miles. My next TGO Planning jobs, which I must get on with is to find out about accomodation in Glenelg (I don;t think there's a hotel there) - and do my "food plan". This is basically an analysis of the TGO walk with a plan as to how much scoff I'll need to carry from the start, whether or not I might post myself some extra supplies, and where I'll need to buy something - and how much. Its not rocket science, but if I get it wrong, it can be a right bugger. I usually carry just that little bit too much. I've also just designed myself a little four day trundle starting at Sanquhar and bagging a couple of Marilyns and some HuMPs (correct capitalisation here!) 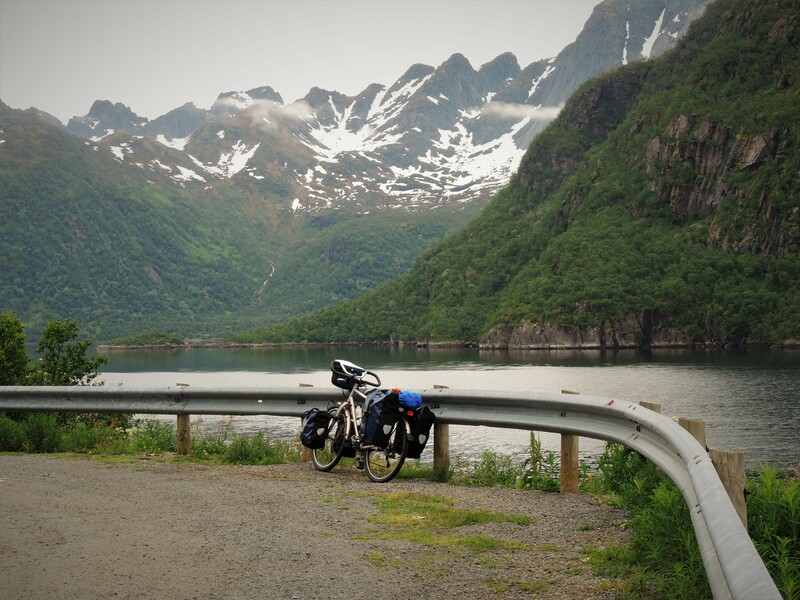 - for the purposes of TGO Challenge training and doing some camping. I will visit the pub in Wanlockhead for a scoff, but all overnights will be wild camps. I picked Sanquhar because its got a train station. I'm quietly buzzing to get on with this one. Roll on April. The Met Office and The Lake District Weatherline, both swore blind, on their mother’s lives, slit their eyes with a rusty knife if they tell a lie, that it would rain in the morning in Cumbria and that by half ten, the sun would be out and it would be a fantastic day for walking up Stybarrow Dodd in particular and best get out there whilst it lasts. So, I saddled up superdawg filled the petrol tank of the knipemobile at the co-op, charged the flask up with particularly hot tea and set off for Dockray. And so we launched ourselves at Bracken How, a diminutive Birkett, and then the very round Round How, which is round. 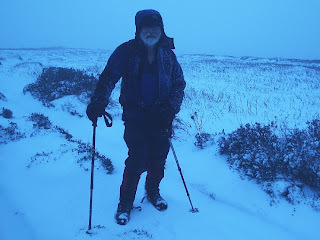 The leg muscles weren;t working very well at this point (sometimes they don’t – I think it might be the statins… or the extra 10kg I’m carrying as a beer belly… or something) anyway, I was struggling a bit up to Birket #3 – Common Fell, and it was still chucking it down. I started planning changes to the walk. Once up on Common Fell, I decided that I’d just do the next two Birketts – Swineside Knott and Brown Hills, then go on to bag the first 2000 foot top – Hart Side - and then I’d pull the plug on this wet wander and wetly wander off to find a cup of hot coffee and, perhaps, a heavily buttered toasted fruit teacake. I lunched behind a wall out of the splattering gale just beyond Brown Hills and then plodded off up the hill to bag the very lovely Hart Side. At this point the cloud lifted a bit and it didn’t look such a chore to go and bag Stybarrow Dodd, which was just about emerging from hillfog. It was now about two o’clock. It was four hours late with the brightening up. Where had it been? And what had it been doing? 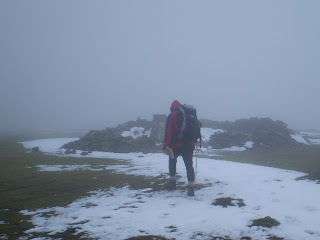 Once at Stybarrow Dodd’s cairn, the fog rolled in again and the rain restarted. 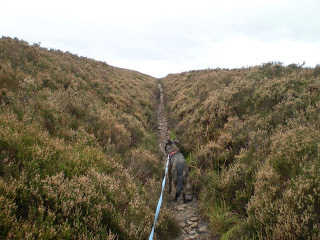 I might as well finish the round from here – so I went down the wrong side of Stybarrow for a bit, navigated myself out of bother for the path that heads North, trogged along to Watson’s Dodd and then up to the shelter on Great Dodd for lunch number two. 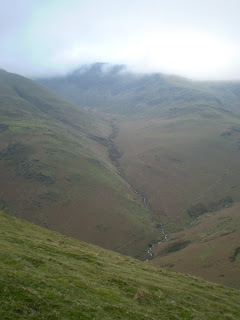 We emerged from the fog at Lurgegill Head, went over Randerside, where views of Clough Head and Blencathra appeared under an arctic blue sky – and down over Birketts numbers 6 and 7 for the day – High Brow and Low How. We finished just as darkness fell. On the way home we drove through a vastly expanded Ullswater – touch and go deep for a Nissan…. Quite good fun, though. I need to shed some weight, I think. The statins are a constant, the beer belly isn’t, and despite it’s cost me several thousand pounds to develop, it’s going to have to go. I may have explained the concept of "radging" in a previous post. For those unfamiliar with the word, and who can;t be arsed looking back through all the posts, basically, it's aimless pratting about. And so, today, I went to visit Brian in his chapel home at Nenthead and we did just a spot of lightweight radging around the old coal mines and moors along the North side of the Nent valley (Nentdale??) - unusual, somewhat for us because our normal places to poke around are lead mines. We finished with a couple of beers in the pub in Alston, entertained by Kipper the collie who's obsession was retrieving increasingly soggy bearmats. 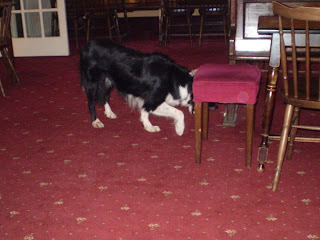 Kipper's a bit shy when it come to flash photography and the pic included here was the best of a bunch, and the flash cause dhim to go and hide under a table for half an hour, till a bunch of keepers came into the pub and gave him hope for more beermat games. I expect all the snow will have gone in a couple of days, so these may be the last white pics for a time. Shame. I was enjoying it. 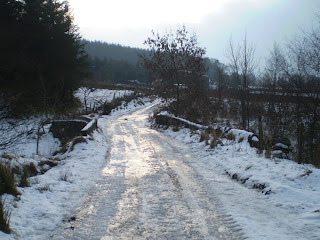 I put my crampons on to walk down the icy tarck by the way. You may consider it overkill. I considered it quite good fun to dance about on the ice. In a slight state of confusion, I decided that as the current cold spell seems to be coming to an end, that I’d best go out and have a plod about in my crampons now, before it all melts in a frenzy of warm Azores air and windy Irish Sea gales. Do it now before it melts. And so, I found mysels and superdawg in a supermarket car park in…er… Haltwhistle…. The idea is for the intrepid walker and his bravehearted mongrel to work their way by stages and various easily linked footpaths from Haltwhistle (the centre of Britain by the way – apparently…) to the Pennine Way at Hartley Burn – possibly the best PW brewing up spot between the other less good ones to the South and some others further North….. – and then walk South to Lambley and walk back again on the South Tyne trail. 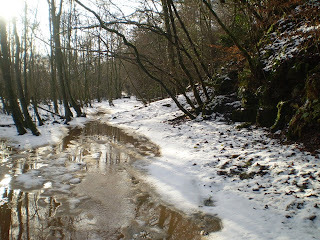 The snow was melting, the sun was shining and the ground and any boggy bits were still frozen absolutely solid. And it was warm! 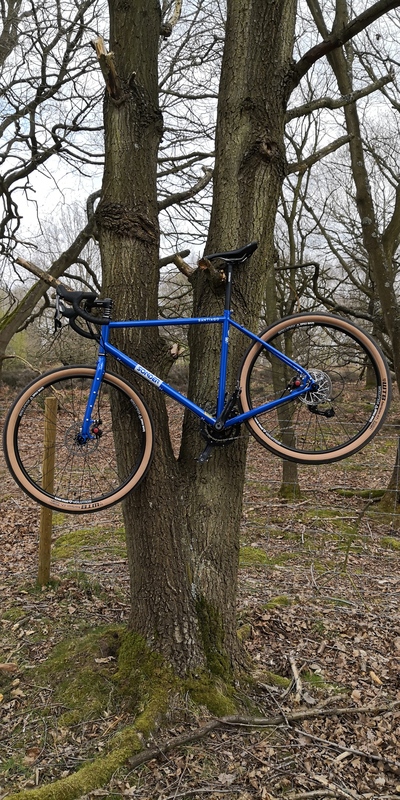 Yes – it was 3C. That’s 10 degrees warmer than the last time I went out. 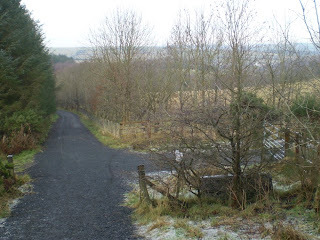 And the South Tyne Trail starts at the source of the South Tyne and walks, cycles, runs and rides a horse to Haltwhistle, mainly along the trackbed of the Halwhistle to Alston railway line, which closed in 1976 after 120 years of being a very big trainset. 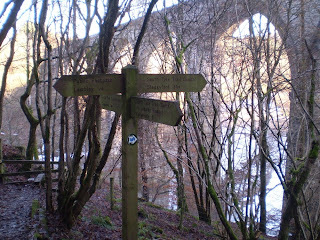 I joined it at Lambley viaduct – which takes the line over the River Tyne. It gets to be a bit of a gently downhill plod after that, although the locals chaps who were out walking their dogs this afternoon were mostly (3 out of 4) intent on having a chat. That’s one of the things I like about this end of England – people are generally interested in having a bit of a chat. I got back to the supermarket in daylight. There’s a sign of spring for you. 11 miles and very little climbing. “There was a lot more snow up here last time I was on this top” Sherpa Tensing 1953. I thank you. Quick! Get the crampons!!! 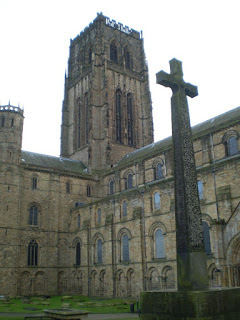 I used to do a fair bit as a voluntary Ranger for Durham County Council, but I gave it all up after I got the notion that I should make space for "something", but not quite knowing what the something was. Any road up, I kept my adopt-a-path duties on. These aren't very onerous and , frankly, get me out of the house yet one more time - er.. actually, its four times. I walk around two routes consisting of linked paths twice a year. One set at Crook and another at Blanchland/Edmundbyers. 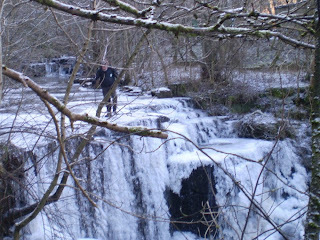 January is the time to do the ones at Crook. 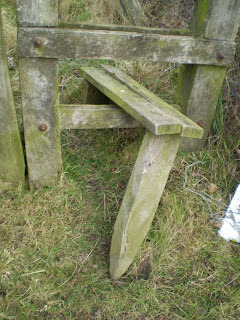 The purpose of this little jaunt is to report back to the DCC on the state of the footpaths and report anything untoward such as a duff stile or a mad axeman slavering wildly at the thought of dismembering a member of Crook Ramblers. It were grand. No really bad axemen, just a bit of too much mud (currently frozen hard), one place to watch that doesnt get overgrown again like wot ot did last year, and a duff stile. I like to return from this little 5 mile daunder and drink hot chocolate and eat toast in front of a roaring telly. I'll be doing this walk again in July. If you ever feel the need to have your bottom packed, by the way, I can think of no better team to do it than the nurses at Alston Hospital. And it comes out of general taxation and NI contributions, and various long term, loans from the Royal Bank of Scotland. We arranged to meet at Charlie’s house in Westgate. Westgate was just –1C at the appointed lunchtime rendez-nous. 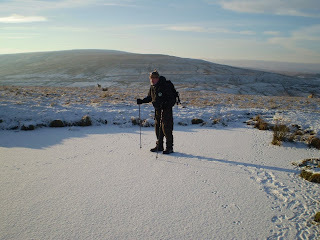 The walk was a blast – we played on a frozen waterfall and climbed up to the 559 metre top (sort of…) of Black Hill and then played a bit more on a frozen pond. And Charlie gave a brief lesson on how to salt-glaze things such as the broken salt-glazed sink we found in use as a water thingy for the local sheep. 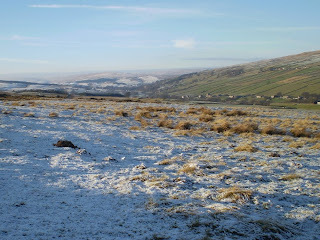 The wind chill on the top was enormously negative and the view included some rainbow-effect, but very small clouds..
Interestingly the South side of Weardale has a thin snow cover and is white and the North side is just frozen, but green. That’s sunshine for you, I expect. We only walked about four miles, but it’s a New Year duck broken. 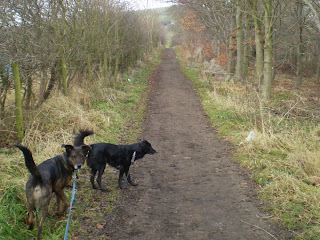 A chap I know only from an internet forum asked me to help him write a bit of a blurb to support a walk he’s doing with his pal and his pal’s dog from Fort William to Glasgow Rangers FC’s ground using the West Highland Way. The thing is, his pal is blind and the dog is his guide dog, Travis. 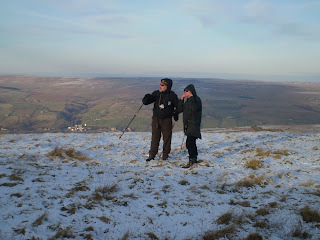 Its not the first time they’ve done this kind of thing and a while back they walked th Pennine Way. The idea is to try to get Rangers players involved in the project (not entirely sure how at the moment) – and the point is, I believe, to raise cash for a guide dog training centre near Forfar. All good stuff, and I’m really chuffed about helping out. I’ll be posting posts about how things progress as they progress. As I’ve never actually done the West Highland Way, I sort of wondered if a blogger and/or Northernpies reader who has done the route, or parts of the route, might like to cast an eye over the draft of the blurb to check it for idiocy – at the appropriate time. This will be unpaid work, though you should get quite good karma from it. Hopefully, the finished thing will be free from any noticeable plagiarism and will be quite a lot shorter than the guide, too. I appreciate that this isn’t the way to do things. Incidentally, the Cotswold shop in Durham recorded a price of £41000 when their till read the bar code for the book. Both me and the shop lad took the view that this was a bit steep and he scutterred off to find out how much it should be. A few minutes later, he gave me a £40085 (** edited to read £40985 following BG's comment. Dhuhhh... )discount, which I thought was reasonable. 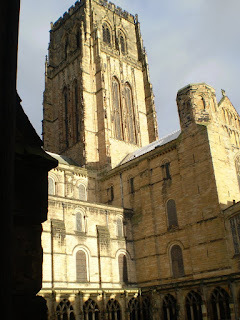 Pics of Durham. Nice cathedral innit? 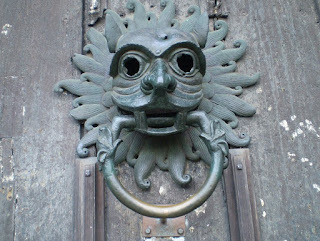 And look at that knocker! Whoar! 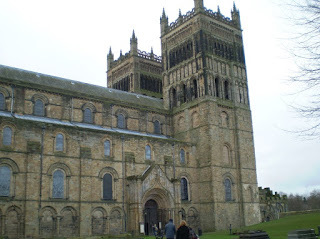 Can’t take pictures inside, but, for those who haven’t seen the interior, it is beautiful in a quite remarkable way. And its free. We like free….